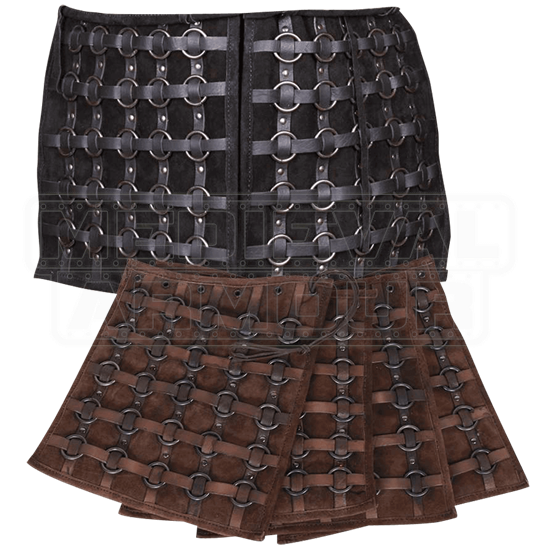 A fierce addition to any LARP wardrobe, the Berengar Ring Armour Tassets feature a suede body and leather strips attached by rivets in a grid pattern throughout. Steel rings at the crossing of each strip complete the intense look. These tassets are perfectly suited to accompany the Berengar Ring Armour Jacket (MY100257), which features the same distinct details. Offering complete thigh protection, the cords on the top edge of the tassets can be attached to jackets. Available in both brown and black, let these intense tassets add a bit of edge to any LARP or historical reenactment ensemble.